At the end of every year, we compile all the information and numbers we can on the past year’s programming efforts. This past year was an intense and difficult year for many of us – and we felt it along side those in our community also struggling through. While it was difficult, it also seemed to go by in a blur – and it was easy to forget how much actually happened in 2017! 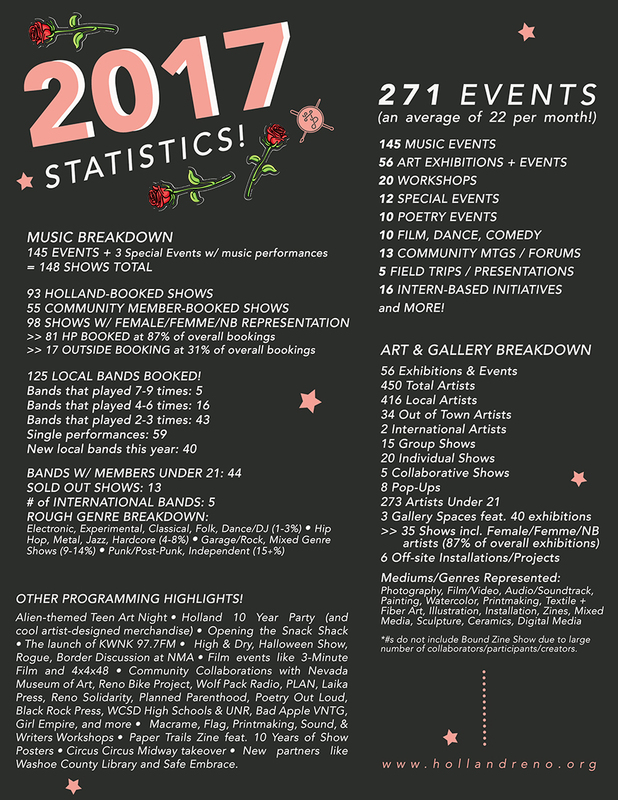 In spite of the crazy year, Holland was able to remain busy and active, producing 271 events from art, music, workshops, special events and more. Below in the graphic, you’ll see #s on the breakdown, and an in-depth look at some more specific stats related specifically to Holland’s biggest arms – art and music. In looking back, there was a lot to celebrate. Some of the highlights include celebrating Holland’s 10th Birthday, rallying for an amazing alien-themed Teen Art Night, producing the desert-themed multi-faceted summer event High & Dry, and two HUGE and impressive Young Blood exhibitions. We were beyond thrilled to finally launch KWNK 97.7fm – a project many years in the making that is an amazing feat and such a community asset. Also so excited to see the launch of Laika Press – now housed with KWNK and already killing it at great workshops and events. Annual events like Halloween Show, Stranger Show, Scholastic Art Awards, All In, Rogue; and the film events like 3-Minute Film and 4x4x48; are such a great showcase of the talent, vision and heart within this community. We were happy to launch the snack shack this year and ready to continue to dial it in with new ideas and pop-ups. And the artist-designed merch for the anniversary festivities completely knocked it out of the park – tee designs from Paige Gomez, Casey Conrad and Emily Jiang; enamel pins from Summer Orr and Alisha Funkhouser, and a very special zine – Paper Trails, feat. 10 Years of Holland Posters, curated/edited by Omar Pierce. We were immensely proud to be able to lend gathering/meeting/workshop space to some amazing community groups – PLAN, Planned Parenthood, Reno Solidarity Group, Girl Empire, Classic Skate Shop, UNR student groups like Brushfire and Environmental Club – and to continue partnerships with some long-time allies and friends – Spoken Views, Nevada Museum of Art, Reno Bike Project, Black Rock Press, Bad Apple Vntg, and more. The ‘Navigating the Space Between’ event at the end of the year, lead by Alberto Garcia, was a highlight for us – a well-curated, educational and emotional discussion forum on border identity and culture. The year closed with a great collaborative zine show in the gallery – Bound, featuring more than 400 zines from collaborators near and far, in nearly every topic. The first Programming Committee Meeting of the year is on Feb 6 at Holland – if this is something you’d like to volunteer for or learn more about, please hit up hollandbooking@gmail.com and we’ll give you the details and rope you in! For more general volunteer opps (like manning the door, helping in the snack shack, photographing at shows, etc), we’d LOVE the help. Please email Jake at vols@hollandreno.org to learn more and to sign up for some shifts. We ask that volunteers give a minimum of 8 hours per month (roughly 2 events/shows). We’d also like to announce Ilya Arbatman is helping out with booking duties – for direct inquiries to Ilya, please email ilya@hollandreno.org. We wanted to shout out Morgan Travis for helping switch Holland’s analog sound board to a digital board – and to all our sound staff for taking the time to train and learn the new system. Shows are already sounding better and working better and we’re stoked to dial this in – and to train new folks on it. If you’re interested in learning to do live sound, please email hollandbooking@gmail.com! Please note: the commitment is usually about 12+ hours per month for training (usually done in roughly 3-4 hr shifts), and most training is held in the evening hours between 7-10PM. The Gallery Committee is currently seeking proposals for spring/summer 2018, with some specific themes/criteria in mind. Please email alisha@hollandreno.org to learn more and apply for an exhibition in one of the three gallery spaces (Main Gallery, Serva Pool, Micro Gallery). And lastly! We are proud to announce Sophia Pierce is taking over Workshop Coordinator duties, and is currently working on solidifying the spring 2018 line-up. Is there something you’d like to learn, do, explore? A topic or theme you’re interested in? Something YOU’D like to teach or share? Let her know: workshops@hollandreno.org.